So we went to Spartanburg (aka Hub City, aka Sparkle City) to sign some books at the Hub City Bookshop and to see if we had missed anything on earlier visits. Sugar-n-Spice restaurant, aka The Spice, has been serving roast beef, burgers and fried chicken livers a-plenty since 1961. Boy, did we ever miss something. 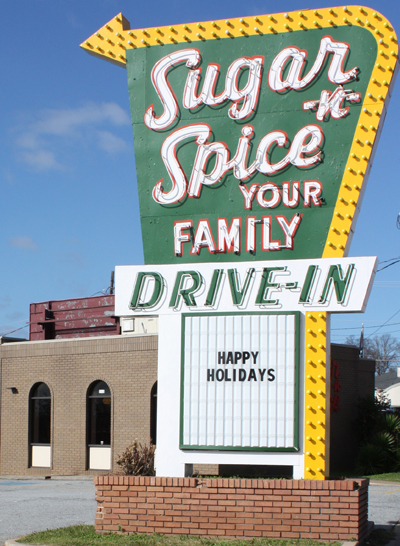 We started off at Sugar-n-Spice(aka The Spice), a former drive-in restaurant that still serves great food. I had the roast beef-a-plenty, which we all know in S.C. means with a bunch of fries and onion rings. This also came with slaw, which was low on mayo and high on flavor. The roast beef was tender and as flavorful as any roast beef I have ever had. I didn’t even mind that it wasn’t rare. The Spice is one of those great South Carolina restaurants owned and operated by Greek families since the 1960s – there are many such places scattered across the state. One of The Spice owners – the Stathakis family – has cousins by the same name who own the Stax restaurants in Greenville. 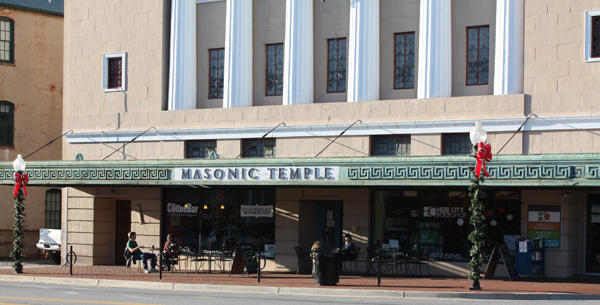 The old Masonic Temple in downtown Spartanburg houses the Hub City Bookshop along with the Hub City Writers Project and Hub City Press as well as Indian River Coffee Bar and Cakehead Bakeshop. After lunch, we drove downtown to the Hub City Bookshop in the old Masonic Temple. The bookstore, part of the nonprofit Hub City Writers Project, is on one side and the Little River Coffee Bar and Cakehead Bakeshop are on the other. The bookstore is fantastic. Hub City publishes about a half-dozen titles, mainly by Southern writers or about Southern things, each year. The bookstore specializes in new releases with a regional focus on fiction and nonfiction, hence the inclusion of “Explorer’s Guide: South Carolina” in their inventory. The store also has a wide selection of bestsellers, children’s books and other general interest fiction and nonfiction. Hub City executive editor Betsey Teter says the bookstore helps keep the presses rolling. On my signing day, Teter’s husband, John Lane, was signing his latest book “My Paddle to the Sea,” which I haven’t finished yet, but I highly recommend just from the first few chapters. If you miss the old-school local bookstore, this is the place to drop in. Even though it is just a few years old, it feels like it’s been there forever, and it’s just across the street from the Herald-Journal, Spartanburg’s daily newspaper, and right next to a little downtown park, Morgan Square, and the city’s clock tower. The coffee shop has some wonderful offerings and the bakery specializes in simply delicious cupcakes (try the Sweet N Salty Brown Sugar Cake with caramel icing and sea salt, yum). Downtown Spartanburg also has what I think every medium to large city needs: racks where you can rent bicycles (like luggage carts at the airport) with several different return locations. Spartanburg has two B-stations: At Morgan Square and at the Rail Trail, a flat, paved walk/bike/skate-way built in an old railroad bed that will become part of Spartanburg’s 12-mile section of the Palmetto Trail. There are some shops downtown, including Pink on Main: a Lillie Pulitzer shop. Although nothing in the store fit me, it was fun to look at the lovely dresses and they were not as expensive as I thought. More than a handful were available for less than $200. A few consignment shops and a couple of restaurants round out the offerings on Spartanburg’s Main Street. Just outside of the downtown are Wofford and Converse colleges. The artist version of Hub City Writers Project, called Hub-Bub also offers 100 nights of art, culture and entertainment in the downtown business district, keeping the area alive and humming while other downtowns fall silent after business hours. Hub City Bookshop (864-577-9349; www.hubcity.org) 186 West Main St. Open Mon.-Sat. starting at 10 a.m. Hub City specializes in regional writers and mostly new releases. The store carries all the books published by the nonprofit Hub City Press and proceeds from the sale of books fund creative writing education and independent book publishing in Spartanburg. West Main St. Open Mon.-Sat. starting at 7 a.m. Little River offers espresso and coffee and features baked goods from the nearby Cakehead Bakeshop. Cakehead Bakeshop (864-585-8774; www.cakeheadbakeshop.com) 188-B West Main St. Open Tue.-Sat. starting at 9 a.m. Full-size cakes and petite cupcakes fill the display case at Cakehead, which is conveniently next to a coffee shop and bookstore. The Sweet N Salty Brown Sugar Cake with caramel icing and sea salt filled the bill on our day. Sugar-n-Spice (864-585-3991; www.thespicerocks.com) 212 South Pine St. Open Mon.-Sat. for lunch and dinner. The Spice as it’s known has a variety of sandwiches and platters from the roast beef sandwich (fantastic) to a chicken liver platter. Order it up a-plenty for fries, onion rings and cole slaw. The restaurant harkens back to its early days as a drive-in. It is still owned and operated by members of one of its founding families. Pink on Main: A Lilly Pulitzer Via Shop (864-515-0088; www.pinkonmain.com) 156 West Main St. This cute little shop has oodles of Lilly Pulitzer dresses, many on sale for less than $200. It’s fun to just cruise through even if you aren’t buying. Spartanburg B-Cycle (864-598-9638; spartanburg.bcycle.com), 226 South Spring St. For $5 you get a 24-hour pass to rent a bike. The first hour of riding is included in the $5 pass. After that it’s $1 per half-hour, up to a maximum of $35 a day. Two conveniently located rental racks let riders enjoy the downtown area without clogging the streets with cars. Downtown workers also can use the bikes to run quick errands during the day. This entry was posted in Dining Out, Shopping, To Do and tagged fried chicken livers, hub city writers project, indian river coffee, south carolina restaurants. Bookmark the permalink. Wow! Who knew there was so much in Spartanburg!! Thanks for the info! !